ADT offer an extensive range of hose assemblies for handling food drink and pharmaceutical products. All our hose assemblies are manufactured with your choice of end fittings such as Triclover, RJT, DIN, SMS,IDF and ILS. Because of our fabrication facilities we can also supply bespoke end fittings. For example extended 90 and 45 degree elbows, dip tubes, tee’s and cross pieces can be manufactured and fitted to hose assemblies. 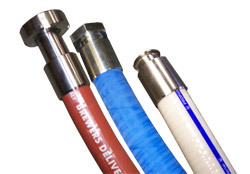 We also supply a full range of loose hose, hygienic fittings , seals, ferrules and tube.